Political corruption is an art form that has been perfected by Ward 20’s Councillor Adam Vaughan in the form of a clever document entitled the Planning Act. Secreted into SECTION 37 of the document are 50 words of legalese to be decoded. Of course, city councillors know exactly what these words mean. In theory, SECTION 37 is designed to deliver benefits to individual wards – playgrounds, art facilities, affordable housing, rec centers, etc. In reality it delivers a pay-off to councillors from developers…RIGHT OUT IN THE OPEN!!! Our Investigative Division is gathering information in an attempt to separate the benefits from the liabilities that reside within the gray area between ethical and legal issues. SECTION 37 allows Councillor Vaughan to negotiate what amount the pay-off from the developer will be and what the pay-off will be used for on an ad hoc (single purpose) basis. Mayor Rob Ford has correctly characterized this process as a ‘SHAKEDOWN’. “If a developer proposes a six-storey structure, the city first says, “NO! Not allowed”. But if you lay a couple million on the local councillor for the projects that the councillor desires, we can possibly smooth out the deal for you”. (It makes one wonder how many public servants get a cut). 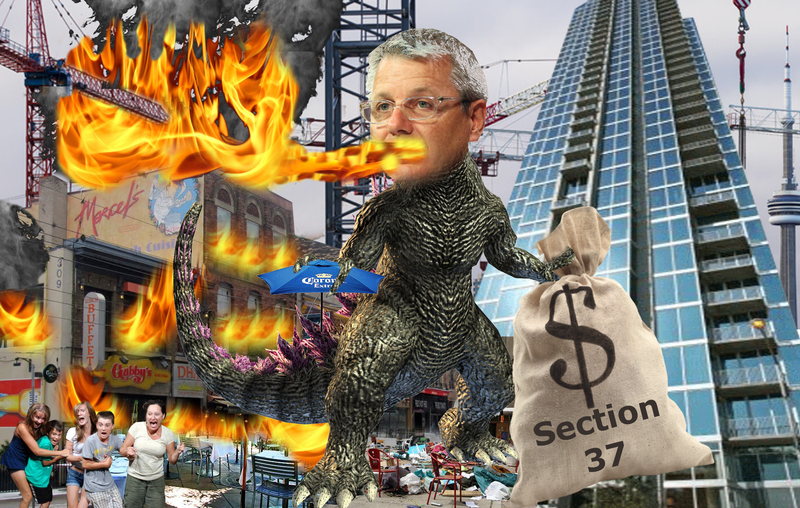 SECTION 37 overrides the city’s Official Plan and allows the likes of Adam Vaughan to shake down the builders to the tune of 51.5 million dollars. If all of this development that we now endure is so great for the city’s individual wards, why are the builders denied approval until they donate to totally unrelated community projects? “It’s disgusting”, railed Councillor Doug Ford. “No councillor at all should be involved in negotiating monies with any developer in the city”. At this time the situation represents the ‘appearance of impropriety’ and the smell of a ‘conflict of interest’. The hardened reality of criminal behaviour in these regards has been dramatically revealed in Montreal. When the chips begin to fall in Toronto, the Quebec politicians that were jailed for the same activity will seem like Boy Scouts. Girl Scouts, too!!! Councillor Adam Vaughan is the leader of the pack of a gang that represents the worst of municipal politics and organized crime. Their reputation as “leftists” serves as perfect cover to plunder city coffers. That’s because the purloined ducats are supposedly used to improve the quality of life for the residents of a ward, especially the less fortunate. But sweetheart deals, kick-backs and shakedowns are surely Adam Vaughan’s odd brand of “socialism”. Your Ward News will continue to expose Councillor Vaughan’s sophisticated burglary tools like SECTION 37 right up to Election Day. True democracy requires facts. It is also a fact that only YOU can improve our city’s future. Contact Councillor Adam Vaughan and demand ALL his financial records. See you at the voting booth. REMOVE SECTION 37 FROM THE PLANNING ACT!!! !